Smoked all 100% Australian beef salami, marinated in Red Wine and garlic, double coated with herbs and mustard seeds. 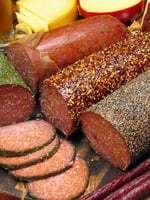 Smoked, lightly brandied 100% Australian beef salami double coated with black pepper and mustard seeds. Famously hot and spicy all 100% Australian beef salami double coated with chilli and mustard seeds. Smoked all 100% Australian beef salami, double coated with red pesto. 100% Australian beef smoked and cooked extremely spicy and hot. Coated with chilli hence the suitable name, short fat sticks. A spicy snack sausage 100% Australian beef, smoked and cooked, hot and spicy with a distinctive pepperty zest. 100% Australian beef, cooked and smoked, short thin sticks. Heavily smoked, 100% Australian Australian beef, long thin sticks.